Twitter ka shaq saahi nikla! After the motion posters of Thugs Of Hindostan released, the Internet insisted that the thugs of Hindostan are giving off major Pirates Of The Caribbean vibes. If you didn't believe them then, Twitter is probably smirking at you right now. The trailer released on Thursday to explicit comparisons with the Pirates Of The Caribbean films - Twitter pointed out how each thug is an Indian version of the prime cast of the Pirates Of The Caribbean films. "AB looks like Barbossa, Kat is Keira (Knightley) and that Dangal wali may have replaced Will Turner," says a user about Amitabh Bachchan, Katrina Kaif and Fatima Sana Shaikh. Meanwhile, Twitter is not ready to budge from their verdict on Aamir Khan's character Firangi Mullah - "A Bhojpuri Jack Sparrow," read a tweet. One comment even referenced Baahubali while describing Fatima's look. TBH, it does remind you of Tamannaah Bhatia's Avanthika from Baahubali: The Beginning. 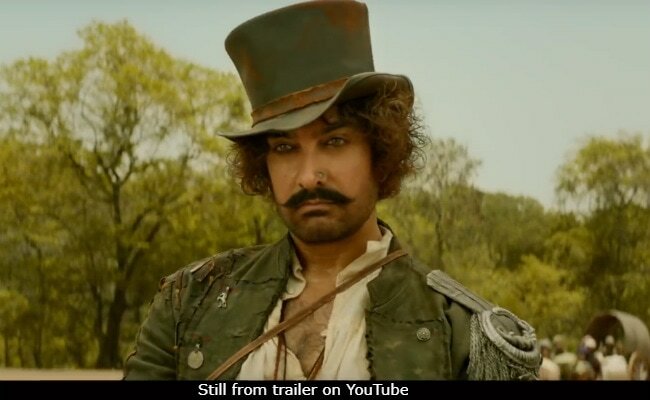 Aamir is one-fourth of the primary cast of the film, playing conman and smooth talker Firangi Mullah while Amitabh Bachchan features as the feisty thug commander of the sea Khudabaksh, also called Azad. Fatima is second in rank in Khudabaksh's army with commendable bow and arrow skills. Katrina Kaif plays dancer Suraiyya Jaan, the details of whose character are still shrouded in mystery. Tbh, didn't like Aamir in trailer. Amitabh was show stealer & Fatima was good too. Aamir looks like a bhikhaariyon ka sasta Jack Sparrow. The same theme! Jack being loyal to none ends up being saviour of all! AB looks Barbossa, Kat is Kiera and that Dangal wali may have replaced Will Turner. ! Others are fine but how can one even dare to get compared with Johnny as Jack Sparrow.. comparison with him is your loss! The trailer reveals that Thugs Of Hindostan is set in 1795, by when the East India Company had begun to rule India. Directed by Vijay Krishna Acharya, the film is a fictional retelling of the thugs' battle against the oppressors to free India from the shackles of the East India Company. The Jack Sparrow-ish Firangi infiltrates Khudabaksh's army in order to rat out his war plans to the East India Company and the trailer ends with a cliffhanging moment when the two thugs confront each other. Thugs Of Hindostan is all set to hit screens on November 8. Thugs Of Hindostan Trailer, People. It's An Aamir Khan Vs Amitabh Bachchan Blockbuster. Which Side Is Katrina Kaif On?